This is a reblog of a great piece written by the Open Data Institute illustrating how open data is key to the development and evolution of smart cities. Open data is data that anyone can access, use and share. Smart city technologies produce huge volumes of data on every subject from the running of the trains to the quality of the air. Collecting and releasing this data provides certain key benefits to a city: it allows more people build solutions to everyday problems, have more informed conversations about the future and save the city time and money. Building solutions to everyday problems. When you empower city residents in solve civic challenges, you increase the number of solutions and thereby the likelihood that one of their ideas will work. Having informed conversations about the future. When you raise the awareness of city residents about what is going on in their city, you make them an active part of the process rather than a passive recipient of technology. Saving city time and money. When you allow city residents to build solutions for their future, you relieve the city of the burden of creating, operating and paying for some of these services. To realise these benefits, tomorrow’s cities will need to build a robust data infrastructure to deliver reliable access to open data for everyone. In Kenya, what initially started off as a small animal husbandry research station, was given to the Seventh Day Adventist Church to create a university, dramatically transforming the area within just 25 years. The University of Eastern Africa, Baraton, in Nandi county, was established 50km away from the nearest urban centre, Eldoret. What was initially an area dominated by agriculture and animal farming, dotted with the shining tin roofs of small shacks and criss-crossed by dirt roads, has now become a well-functioning university town. With a student population ranging from 2,500 – 3,000 every year, most of whom stay off campus, businesses have been drawn in, roads have been tarmacked, land use has shifted with more buildings going up and social services have mushroomed. While the negative drawbacks of this university development have been felt with hikes in prices, the spread of sexually transmitted diseases, increasing insecurity and cultural erosion, the benefits outweigh the negative. The concept of ‘net-positive’ was explored, referenced and supported throughout both the Annual Conference of the Environmental Association for Universities and Colleges and the International Sustainable Campus Network Annual Conference in Hong Kong early this year. Both recognised a growing focus on the way in which universities and cities can form effective, collaborative alliances to contribute towards meeting the challenge of urban living in the 21st Century. It’s a response to the World Economic Forum Global Risks 2015 report which flags up climate change, urbanisation and growing population and aspirations within them. City leaders in Africa need an education on the outsized role universities can play in shaping urban environments. Samantha Spooner writes for the World Economic Forum that a few cities on the continent have formed partnerships with academia — but most never bother. Universities and colleges are desirable partners for developing cities, Spooner writes. They usually own prime real estate in central areas and can tap financial endowments. The issue of cities teaming with educational institutions was debated late last month at the Africa Universities Summit in Johannesburg. A few cities have taken advantage of local universities, the article says. The University of the Witwatersrand in South Africa partnered with Johannesburg to add affordable student and staff housing to a downtown district. The American University in Cairo relocated most of its campus in 2008 from crowded Tahrir Square to a satellite city 45 minutes away. That freed up more space in central Cairo for other development. There are opportunities for universities and cities to work collaboratively in both the developed and developing nations. Whilst there are examples of good practice in Europe there are nowhere near enough of them. It needs a strong sense of leadership on both sides – a willingness for Vice Chancellors and senior academics and professional staff within universities to build effective working relationships and their local authorities, strategic partners, Mayors, business leaders such that effort and investment is made in common goals. Ben Harrison, Director of Partnerships at The Centre for Cities has written a great piece this week about the governance issues affecting city regions and the pace of devolution. The announcement this week that the Government plans to hand a significant amount of EU funding directly to the [Manchester] city-region, but will resist doing so for other places across the country, is a further reminder of the clear blue water that can open up between cities in terms of the powers they wield, and the funding they control, when they get their governance right. Come 2017, Greater Manchester will have new powers over transport, housing, land, planning, police, fire, and children’s services, while other city-regions – even those in which real political and administrative progress has been made – have not yet decided either whether they are prepared to do a deal, or the basis on which they would do it. Read the article by Ben Harrison at There’s more to devolution deals than the prizes on offer today. The District Energy in Cities Initiative will support national and municipal governments in their efforts to develop, retrofit or scale up district energy systems, with backing from international and financial partners and the private sector. The initiative will bring together cities, academia, technology providers and financial institutions in a joint ambition to build the necessary capacity and transfer of know-how while engaging all stakeholders and reducing emissions. Twinning between cities – matching champion ones with learned ones will be a key component of the new district energy in cities initiative to scale up lessons learned and best practices. 19 cities around the world have indicated interest in joining the initiative. In addition to Danfoss, eleven other private sector and industry associations’ partners commit to contribute technical. In addition to UNEP, six intergovernmental and government organisations as well as networks are interested to support the new initiative and to facilitate technological expertise. This new initiative is being co-ordinated by UNEP and Danfoss with lead partners ICLEI and UN-Habitat. A key finding was that LOCAL GOVERNMENTS ARE UNIQUELY POSITIONED TO ADVANCE DISTRICT ENERGY SYSTEMS in their various capacities as planners and regulators, as facilitators of finance, as role models and advocates, and as large consumers of energy and providers of infrastructure and services (e.g., energy, transport, housing, waste collection, and wastewater treatment). This was something I wrote about in previous blogs on this site. See: Waste, Steam and District Heating in Nottingham; Can we be transparent on District Heat Data? ; 4th Generation Heat Networks; Cities Take the Lead on District Energy. Cities As Platforms – To evolve, cities must be viewed as platforms, with populations encouraged to utilize technology to creatively disrupt and redefine core functionalities. Every digitally enabled citizen living in a city is a hub of real-time data. When analyzed in isolation, there’s no actionable intelligence. But when you view the data we produce on a macro scale, the possibilities for radical inventiveness are endless. 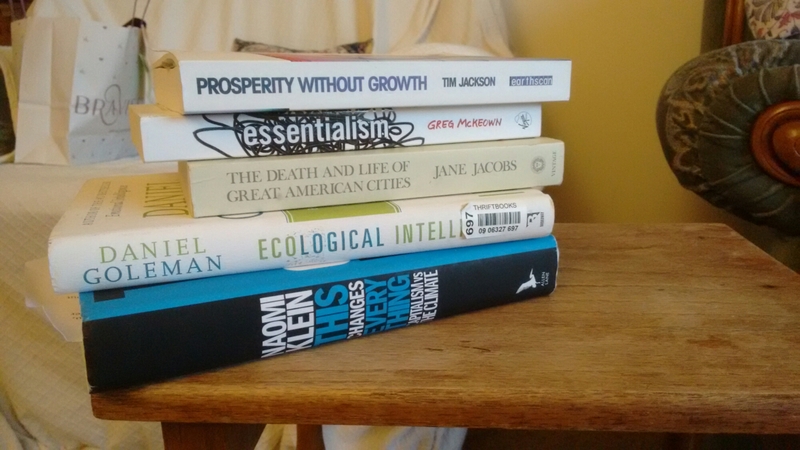 As a sustainability practitioner I pick up the odd recommendation for books here and there. However, it’s hard to track down ‘killer’ books – ones that aren’t particularly dry and stale on very particular topics, but those that are challenging, force you to reevaluate your world-view and change your perspective. The following reads may not do this for you, but they did for me and so I thought they were worth sharing. Tim Jackson was working at the Sustainable Development Commission when this book was born, and there’s not been a better explanation of the fallacy of infinite growth, and of how growth doesn’t automatically correlate with what really matters. Slightly too academic in places, but still a compelling case for moving on from our existing approach to development.